There is a lot of talk about how legalized sports gambling in the U.S. could infuse the industry with new revenue opportunities. Experts see growth in everything from fan engagement to sponsorship, viewership, and advertising. Many see prop betting (bets made on in-game outcomes) as the biggest opportunity – especially as a way to attract people to the venue. Listen to one of sport's visionaries, Ted Leonsis, describe how he envisions the stadium experience of the future in this video. $3.1 billion; that’s the estimated annual revenue of the US sports betting market by 2023. As much as $380 billion is wagered illegally in the U.S. each year, according to The American Gaming Association. Even traditional revenue streams stand to benefit from this opportunity. According to a Nielsen study, legal sports betting would positively impact NFL media rights by 17.9%, sponsorship by 7.6%, ticket sales by 6.5%, and merchandise by 2.1%, representing a $1.75B increase in annual revenue from fan engagement. NBA is the first U.S. pro sports league to sign a deal with a gambling partner. Vegas Golden Knights are the first NHL team to sign a deal with a sportsbook operator. Dallas Cowboys are the first NFL team to sign a deal with a casino partner. 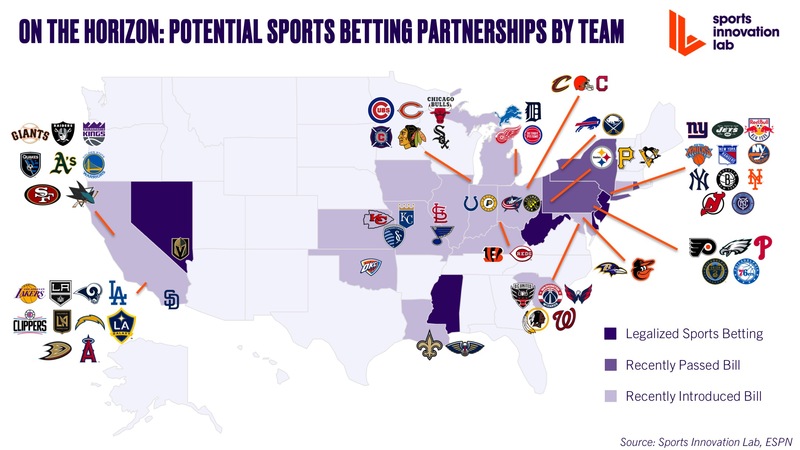 *Note this analysis excludes casinos, which exist in most states and have been approved to become corporate partners of NFL teams. So the big question remains are stadiums ready to deliver real-time data for fans who want to bet in the venue? 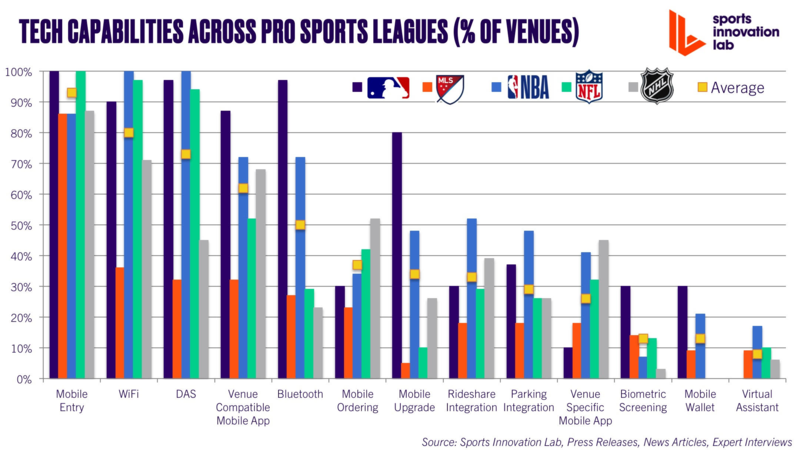 For example, our proprietary Smart Venue Viability research finds that only 15% of NHL-only arenas are equipped with Distributed Antenna Systems (DAS), the technology that boosts mobile connectivity and network access. The NBA, including multipurpose NBA/NHL arenas, has DAS installed in 100% of arenas. If venues are going to deliver on this technical challenge, these leagues will need to start looking at how they serve their fans digitally, and not just from a social media standpoint; data and Wi-Fi are about more than just Snapchat. The risk of moving too quickly or doing this wrong is not small for the major sports properties. A FiveThirtyEight profile shows an example of how every crack in the system will get exploited. Networking delays, broadcasting delays, instant replay calls… it's a pretty complicated tech stack and every rule change will impact gamifying and protecting the integrity of the product on the field, court, or ice.